I'd never head of Gadgeteer before. Looks like a good solution for people working in the .NET framework. Thanks for sharing. Have you played with Phidgets before? It sounds like you've just read about them, but I'd love to hear your thoughts if you get around to using them for anything. No, unfortunately, I've never used Phidgets and my comparisons comes solely from the data in Ken's article which this post was based upon. If you would like to send me some hardware to test, I'd love to learn more about it and do a review. I have heard good things about Phidgets from others. Great blog-post :) How could I miss this one on the GHI-Forums? I have worked with Phidgets and like them because they are very easy to use, especially for somebody like me that was not trained in electronics and was hindered by having to use a breadboard or risking to blow stuff up by not using proper resistors and other safeguards. I also love that they give you the choice to program in any language you like, even in obscure rare ones. For me choice is a huge plus, I like the idea of Gadgeteer, but when reading that it only supports .net, the thing is off the table again. And for the same reason, the Arduino is not a choice for me, because I won't use C for it. I do my projects in Python and have initially used Phidgets, and now use a Raspberry Pi, as I have become a little more knowledgable about electronics. Phidgets is relatively expensive compared to the other two, but offers a lot of choice and ease of use for it, they also have ready made plug and play components for pretty much any use case. I just wanted to chip in here as nobody seems to know about Phidgets really and the comparison seems unfair just considering the price and not knowing what Phidgets really can offer (it is a small company from Canada, and we want to support these, don't we?). 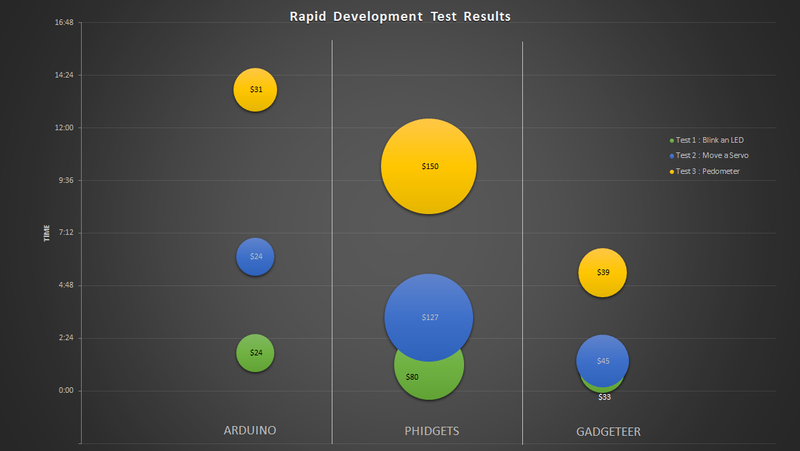 I think the comparison is also biased as if you already know how to use an Arduino, program it, have all the electronics know how, you don't count the time that it took you to learn that, while Phidgets does not require it, so it is probably best geared towards beginners and will likely not offer much to a electronics and Arduino pro. Nigra, this comparison was never meant to be an exhaustive comparison of any of the platforms. It was meant to be from the perspective of someone that already knows the platforms well and how quickly they are able to develop a solution. I'm learning more about Phidgets and agree with all of your points. I've been in discussions with them and its very likely that you will see an exhaustive review of Phidgets on this forum in the future. So, stay tuned! However, I do have a problem with part of your argument. You say you pick a platform because you want choice but then you discard the two platforms that use two of the most widely used languages of today (http://www.tiobe.com/index.php/content/paperinfo/tpci/index.html). So, it doesn't seem that you want choice you simply want Python. That's OK but I would encourage you to not discard others because of this one factor. Also, you might want to check out the microPython (http://micropython.org/). My intention was not to criticize you, we all have our opinions and our biases, just from the point of not knowing all platforms or preferring some features over others. I'm surely very biased towards Python, as it is the only language for me that I can create things easily and efficiently. C is just too hard for me, so you could say that programming is not my best skill, I think I'm actually pretty weak in it. I will check out micropython, thanks for that tip!